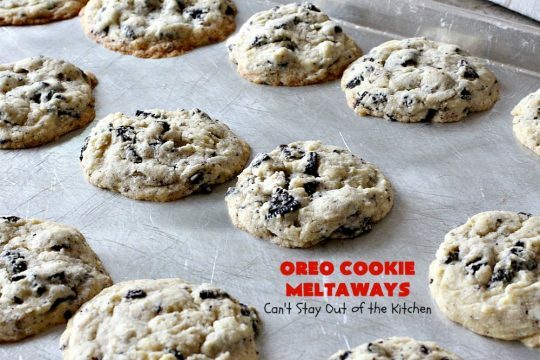 Oreo Cookie Meltaways are marvelous. 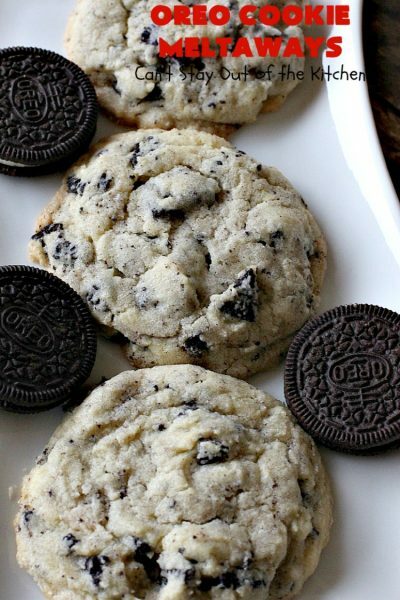 What’s not to love about a cookie with Oreos in it? 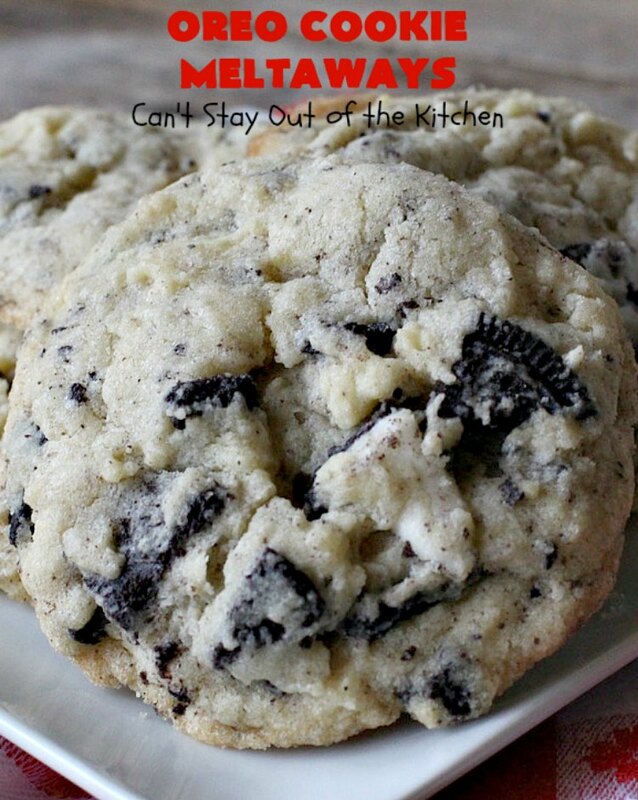 These are melt-in-your-mouth sugar cookies for sure. 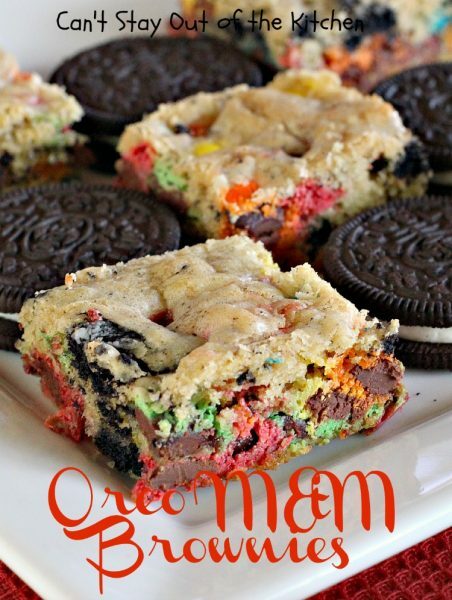 Then they’re stuffed with Oreo cookie chunks. 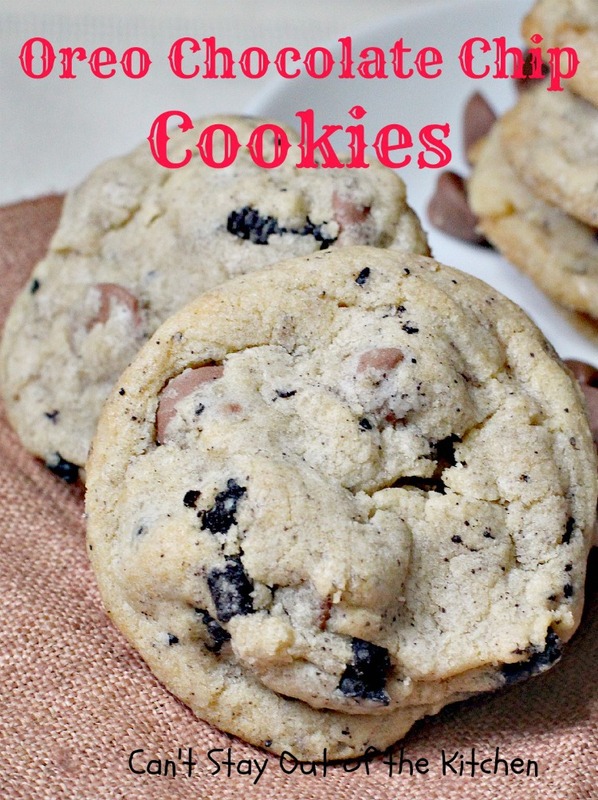 They are sweet, rich, decadent, chocolatey, and have wonderful texture. Not only are these cookies scrumptious, they are fairly quick and easy to make, too. You can have a batch of these ready in about 15 minutes. I cut each Oreo cookie in eighths rather than crushing the cookies before adding them to the cookie dough. 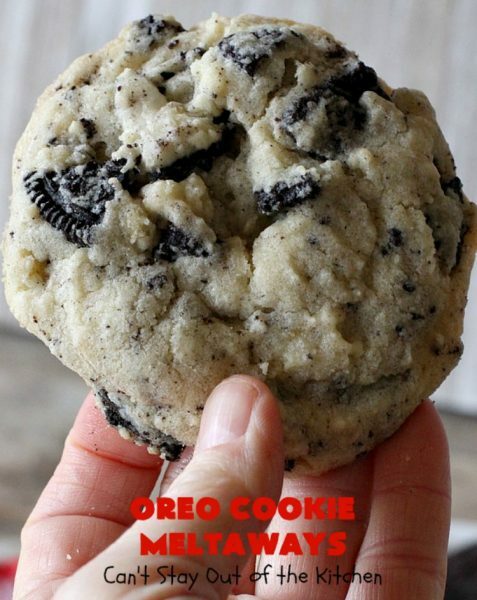 This means there were larger chunks of Oreos in the cookies rather than just a lot of crumbs. I believe the texture was more delicious this way. 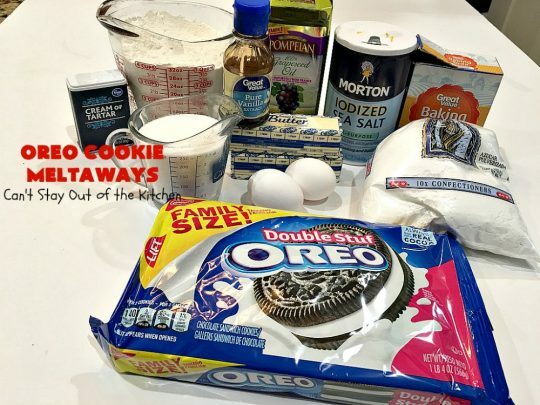 I wanted to make a cookie for Christmas using Oreos. I decided to pull out a recipe I’ve used before from a friend. 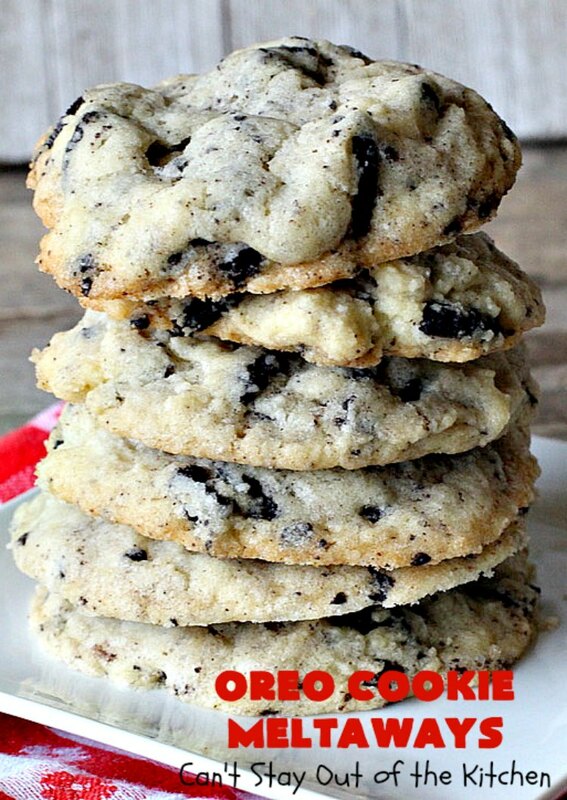 But instead of using chocolate chips or Heath English toffee bits, I used Oreo cookies instead. The results were just as spectacular! 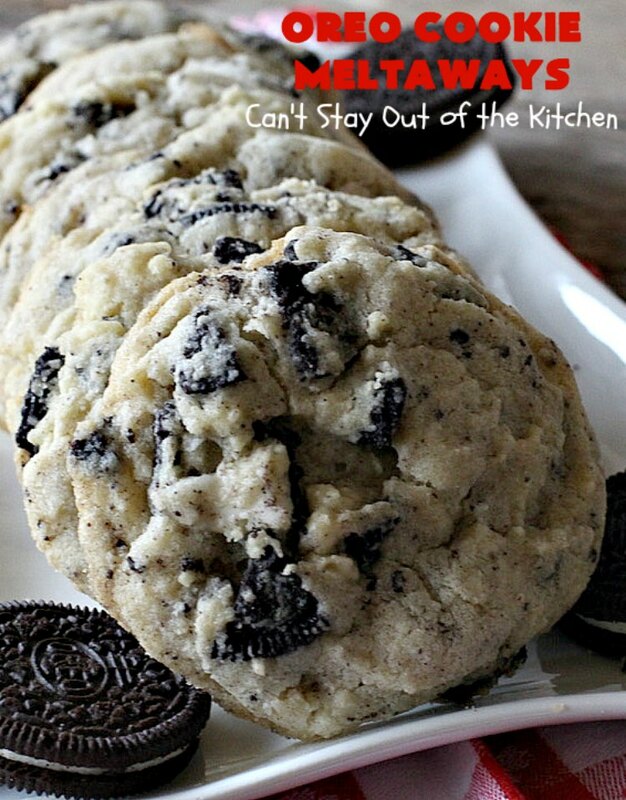 The creamy Oreo filling is just delightful in this recipe. If you’re looking for a great recipe for holiday baking this year, then give these cookies a try. I first published this recipe in December 2013. The cookies looked okay, but I thought they were do for some new pictures. 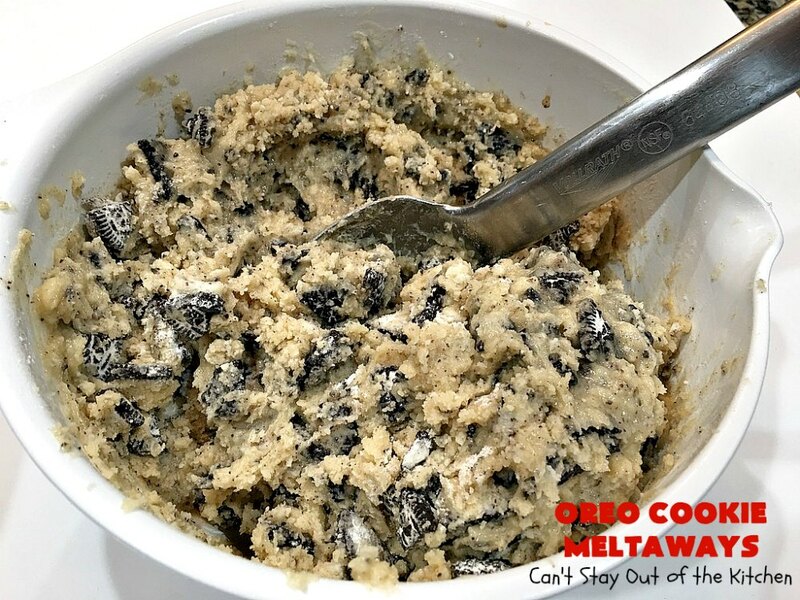 I recently remade this recipe (December 2018) for our mini Christmas Cookie Extravaganza. This time I made them much larger and really liked the way they turned out. 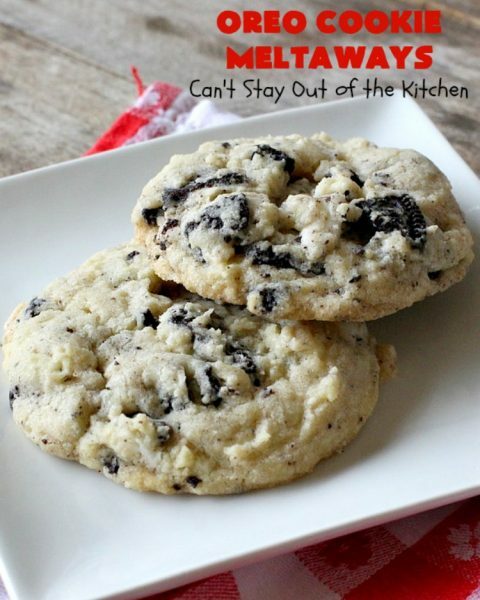 Oreo Cookie Meltaways are wonderful. Take a platter of Oreo Cookie Meltaways to your office holiday parties and they will be consumed in no time. Here’s a stack of these tasty treats. Soften butter. Add powdered sugar, granulated sugar, vanilla, eggs, cream of tartar, baking soda and salt. Add UNBLEACHED all-purpose flour. Bleached flour toughens baked goods. Cut Oreos in eighths. Add to mixture. Stir with a heavy metal spoon to combine. Spray cookie sheets with cooking spray. 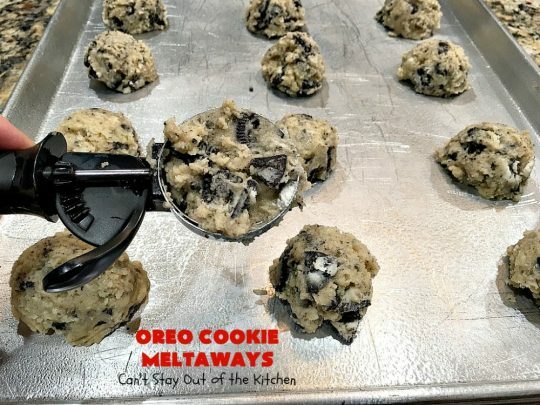 Scoop dough in one-quarter cup amounts and place about three inches apart on greased baking sheets. Bake at 350 for about 15-17 minutes or until done. Cool completely. Oreo Cookie Meltaways are marvelous for tailgating parties. 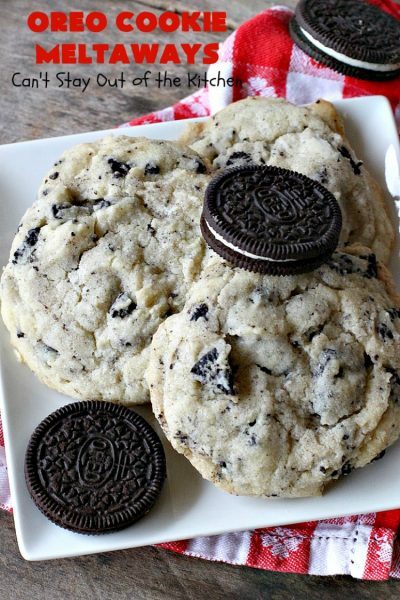 Chocolate lovers and Oreo Cookie lovers will love these addictive cookies. 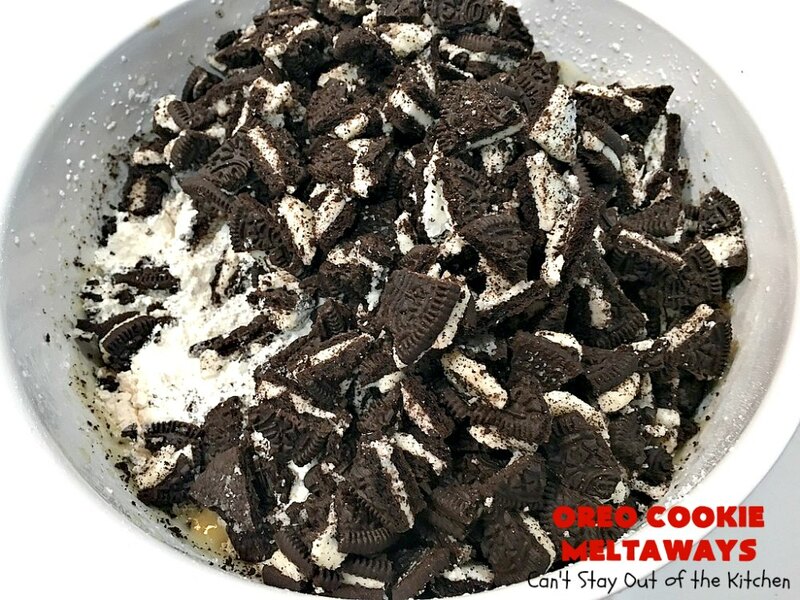 Your family will love digging into Oreo Cookie Meltaways. 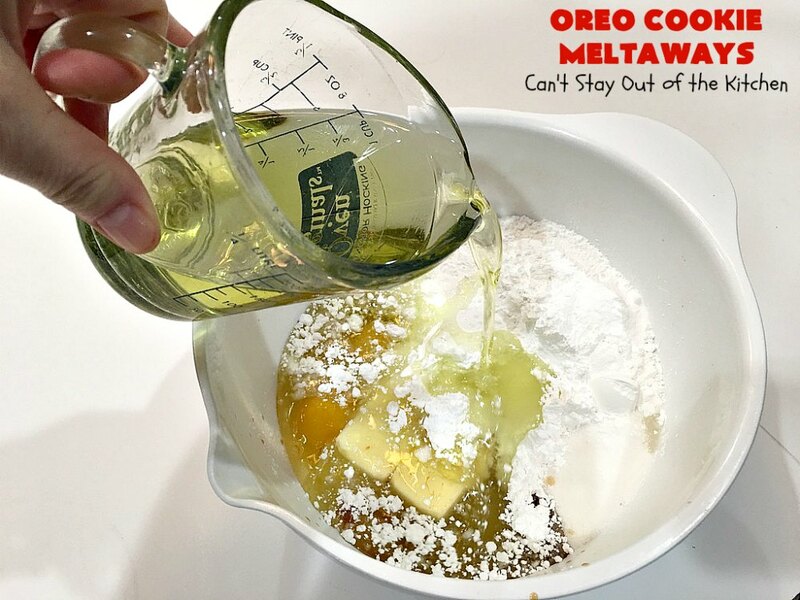 Oreo Cookie Meltaways simply dissolve in your mouth. These delicious sugar cookies are filled with Oreo cookie chunks. They're rich, decadent, chocolatey and spectacular! Terrific for any kind of holiday or tailgating party. Mix butter, oil, eggs, vanilla, sugars, salt, cream of tartar, and baking soda with an electric mixer until smooth. Stir in flour and chopped Oreos with a wooden spoon. Scoop dough with a one-quarter cup scoop and place on cookie sheets sprayed with cooking spray. Bake at 350° for about 15-17 minutes or until done. NOTE: I used Oreo Double Stuffed Cookies. 30 cookies yielded about 5 cups of Oreos when cut in eighths. NOTE: Warning! You need a large one-quarter cup scoop for this recipe. 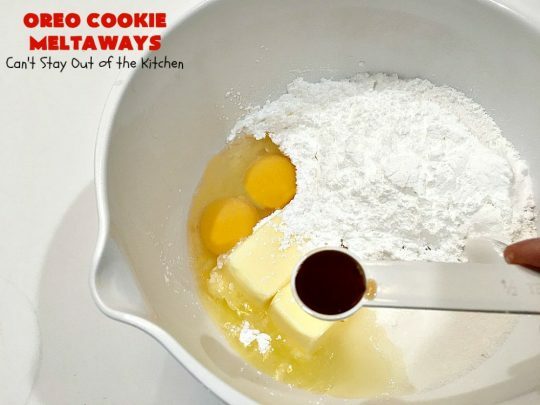 If you make the cookies smaller they will run together while baking. 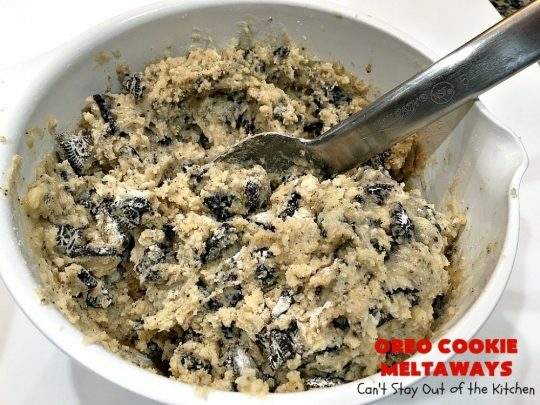 If you do not have a one-quarter cup scoop, then chill the cookies for 30 minutes before baking so they do not run excessively and into each other while baking! NOTE: Make sure you place the cookies at least three inches apart on the cookie sheet to allow for spreading while baking. Delicious sugar-type cookie filled with Oreo cookie chunks. Rich, chocolatey, spectacular! Roll dough into balls and place on cookie sheets sprayed with cooking spray. Bake at 350° for about 10-12 minutes or until done. If you want a slightly flatter cookie, press cookies down very gently with a fork in a criss-cross pattern before baking. 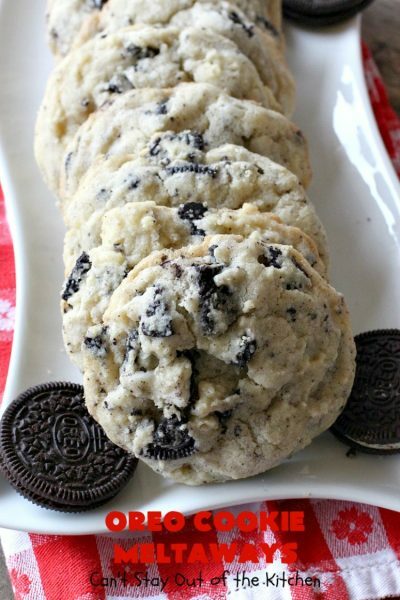 These kid-friendly cookies will have everyone coming back for more! 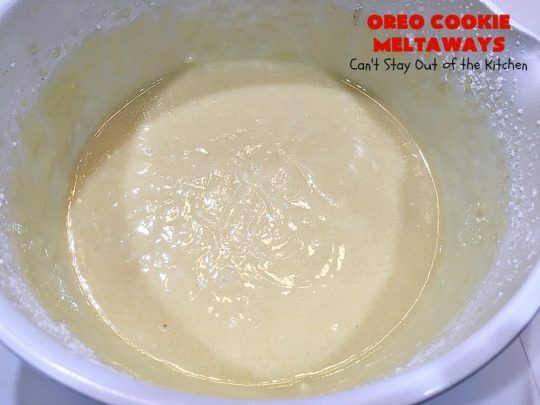 Have a couple of Oreo Cookie Meltaways with a glass of milk and sit back and enjoy! Why not consider adding these delicious jewels to your holiday baking this year?